Soterios Trambas was born in Arta Greece on July 17, 1929. 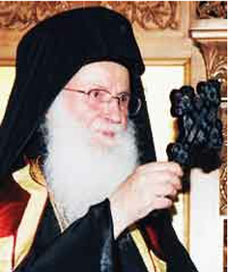 After graduating from the High School in Arta, he graduated from the University of Athens School of Theology in 1951. He then served as an army officer for two and a half years. Upon completion, he served for two years as preacher and catechist in the Middle School and High School. On June 26, 1956, he was tonsured as a monk at the Lemonos Monastery in Lesvos, and three days later, he was ordained as a Deacon. On June 12, 1960, he was ordained to the priesthood. Later that same year he was elevated to the rank of Archimandrite. From 1965 to 1968 he served as a chaplain in the Greek Army. Later in 1968, he was appointed Chancellor of the Archdiocese of Athens and also Dean of the Cathedral in Athens. In 1973, he volunteered to serve as Dean of the Holy Mother in Papagou Church in Athens. In November of 1975, he volunteered to serve the Church in Korea. With permission from the Ecumenical Patriarchate, he served as Dean of the Saint Nicholas Church in Seoul. In 1986, he was appointed Chairman of the Orthodox Eastern Mission, establishing churches in Busan, Inchon, Jeonju, Palang-ri, Chuncheon, and Ulsan. In Addition, he founded the Transfiguration of the Savior Monastery in Kapyung, a temporary chapel in Ilsan, and he participated and supported Orthodox missions in Hong Kong, Singapore, the Philippines, Indonesia, and India. In 1982, he established the Saint Nicholas Theological Seminary in Seoul for the purpose of training the Asian faithful to serve the church. In 1993, the Holy Synod of the Ecumenical Patriarchate elected him Bishop of Zela to serve as the auxiliary bishop to the Metropolitan of New Zealand. In 2000 (February 27-March 2) Orthodoxy celebrated 100 years of existence in Korea. His All Holiness Ecumenical Patriarch Bartholomew, an Archbishop representing Patriarch Alexei of Moscow, and several other bishops, priests, and faithful came from various parts of the world to recognize and honor this festive and historical achievement. In 2000, His Eminence also received a certificate and medal from the Mayor of Seoul acclaiming him as an honorary citizen of Seoul. On April 20, 2004, the Ecumenical Patriarchate decided to elevate the Church of Korea to a Metropolitanate, and on June 20, 2004, His Eminence Metropolitan Soterios was enthroned as the first Metropolitan of the Orthodox Church of Korea at St. Nicholas Cathedral in Seoul. In 2008 he was elected Metropolitan of Pisidia. Established seven Orthodox communities, eight chapels, and a Mission Center Facility. Produced approximately one-hundred publications in the Korean language, with many of these being translations of the Liturgical Services. Organized Sunday Schools, youth groups, philanthropic organizations, bible study groups, and scholarships. The church serves the spiritual needs of visiting sailors and also performs blessings, when invited, to many ships that are built in the Korean shipyards. Since 1992, the church has expanded its service of pastoral care by providing for the spiritual needs of the Orthodox people from Russia. Marriages, baptisms and Divine Liturgies are periodically worshipped in the Slavonic, English and Greek languages.